In March 2018, far-right activist Yumiko Yamamoto of Nadeshiko Action traveled to Brookhaven, Georgia to stage a protest against the “comfort women” memorial installed in the City’s Blackburn Park, joined by another Nadeshiko Action member Shizuko Culpepper from Minnesota. They apparently took particular offense to the fact that the City celebrated annual cherry blossom festival in the same park that week, as the two felt that cherry blossoms was “the symbol of Japan” and should not be juxtaposed along the comfort women memorial. During the same trip, Yamamoto visited the infamous Confederate memorial in Stone Mountain, Georgia and gave a speech to a conservative group after she returned to Japan, on April 19th (YouTube). The speech is in Japanese, but she repeats much of the same thing in an English advertisement published on the June 2, 2018 edition of Weekly NY Seikatsu, a mostly Japanese language publication for Japanese residents in the New York area (PDF version here). Yamamoto further writes, “Although the Confederates lost the Civil War, they praise the courage and honor of those who fought and died for the confederacy. 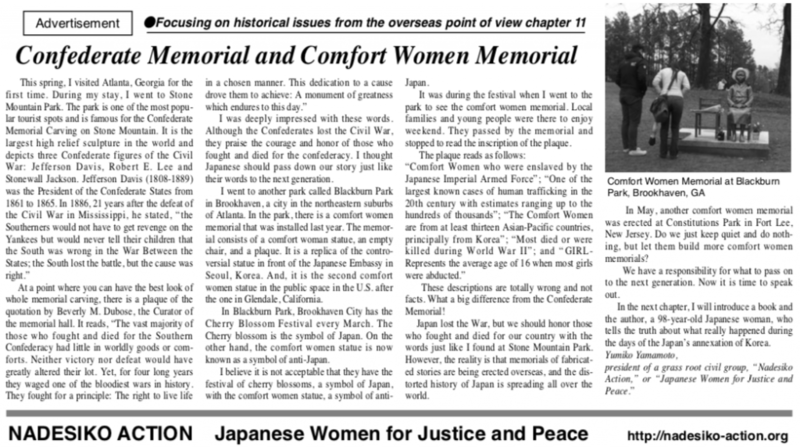 I thought Japanese should pass down our history just like their words to the next generation.” She contrasts the memorial praising Confederate soldiers with memorials dedicated to the victims and survivors of Japanese military comfort women system, arguing that comfort women memorials are “totally wrong and not facts.” “What a big difference from the Confederate Memorial!” exclaims Yamamoto. 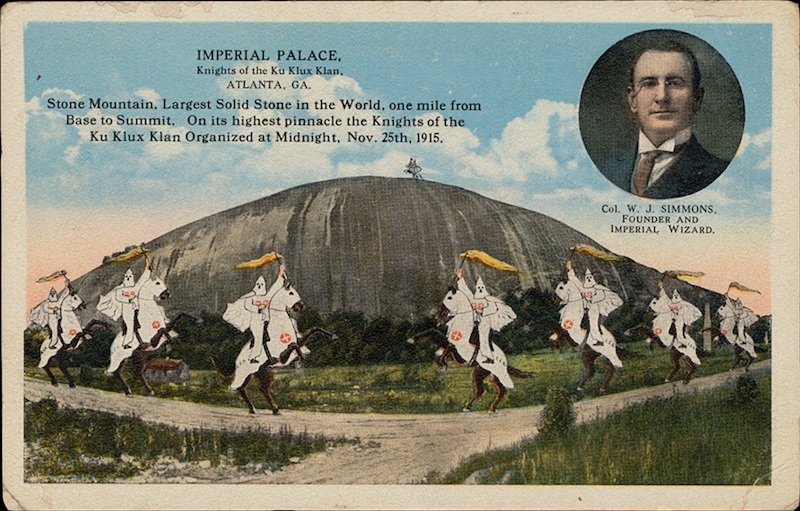 Stone Mountain is the exact site of the 20th century revival of the Ku Klux Klan, who climbed up to the summit of the mountain on Thanksgiving Day, 1915 to give birth to a new generation of the Klan after the original Klan from the 19th century went dormant. The KKK held enormous annual cross burnings at the site for decades since then. The Confederate carving was proposed by C. Helen Plane, a charter member of the United Daughters of Confederacy. The construction was delayed repeatedly until the segregationist Governor Marvin Griffin pushed the state to purchase Stone Mountain and complete the project. Even today, Stone Mountain continues to serve as a sacred spot for white supremacists, for example as the campaign launch location for former KKK leader and frequent political candidate David Duke, even as the criticisms toward memorials glorifying the Confederacy spread across the American South. It is for this symbolism Dr. Martin Luther King, Jr. declared “Let freedom ring from Stone Mountain of Georgia” in his famous “I have a dream” speech in 1963. Yamamoto’s adoration for Confederate leaders and memorials is perhaps not an accident: until late 2011 she was the vice president and secretary-general of Zaitokukai, an extremist anti-Korean hate group that target Korean children, families, and businesses. She has never renounced or denounced Zaitokukai even after exiting the organization, explaining in her 2014 book that she only left the organization to focus on the comfort women issue. In fact, Nadeshiko Action continues to spread anti-Korean extremist rhetoric, for example by submitting a letter to the United Nations Commission on the Elimination of Discrimination Against Women (CEDAW) titled “Hate speech masquerading as Anti-Hate speech by privileged Korean Residents in Japan,” alleging that Koreans living in Japan enjoy special privileges over Japanese nationals, which is the core (and unfounded) talking point of Zaitokukai. The 2018 short documentary Graven Image by Sierra Pettengill uses archival footages to tell the history of the Stone Mountain and its place in the continuation of white supremacy in America. Graven Image can be viewed online thanks to PBS’ POV series.